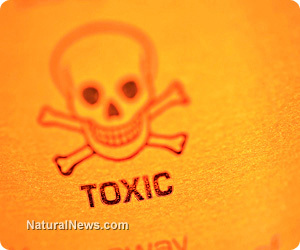 (NaturalNews) A new study on dietary toxin exposure found that all the participating children exceeded the cancer benchmark levels for arsenic, dioxins, dieldrin, and DDE, while 95 percent of preschoolers exceeded the non-cancer benchmark for acrylamide. More worrying was that the cancer risk ratios were exceeded 100-fold for arsenic and dioxins. Researchers at the University of California, Davis recently carried out the first-ever study to consider dietary exposure to 11 toxins simultaneously, including acrylamide, arsenic, lead, mercury, dioxins and several banned pesticides (chlordane, DDE, dieldrin). The study's participants included 364 children aged two to seven, 446 parents of young children, and 149 older adults, all living in California. To assess exposure levels, researchers used food-frequency questionnaires along with toxin content datasets from the Environmental Protection Agency. Exposure levels were then compared with the "cancer benchmark" of each toxin, which is the exposure level that would generate one excess cancer per million people over a 70-year lifetime. Non-cancer benchmark levels were also considered, for health effects other than cancer. The researchers found that average exposure levels of the children and adults exceeded cancer benchmark levels for arsenic, lead, dieldrin, DDE and dioxins, while the children also exceeded cancer-benchmark levels of chlordane. Both children and adults also exceeded the non-cancer benchmark for acrylamide exposure. Most worrying was that for each of these toxins, children showed greater exposure margins than adults. In fact, children exceeded the cancer benchmark levels 10-fold for DDE, nearly 100-fold for dieldrin, and over 100-fold for arsenic and dioxins. Researchers noted that children are most at risk from these toxins because they are still developing. Arsenic has been linked to liver, lung, kidney, and bladder cancers. Dieldrin is a banned insecticide suspected to cause cancer, Parkinson's disease and low birth weight. DDE is a metabolite of the banned pesticide DDT, and is known to damages cells' genetic material. Chlordane is also a banned pesticide and has been linked to cancer, neurotoxicity and low birth weight. All of these toxins, and especially dioxins, are also suspected endocrine disruptors and may therefore also disturb the development of the children's immune, nervous and reproductive systems. Also, foods with the highest pesticide residues were (non-organic): tomatoes, peaches, apples, peppers, grapes, lettuce, broccoli, strawberries, spinach, pears, green beans and celery. It's rare that the authors of a peer-reviewed journal article publicly recommend a switch to organic foods, but that's exactly what these researchers have done. Far from being just for snobs, organic products now appear to be a necessity for anyone wanting to protect themselves and their children from potentially dangerous levels of multiple toxins which now pervade our environment and food supply.